I have been County Councillor for Holbrook since 2005 and lived there with my family for over 30 years. My priority is to represent all Holbrook residents, respond to their concerns and get things done. It is often getting the small things fixed that counts and I am committed to continue to make our neighbourhood a place we can be proud of and enjoy living in. In my previous role as Cabinet Member for Adults' Services and Health my aim was to support the most vulnerable people in our community and enable them to stay healthy and independent. I was pleased to ensure the Meals on Wheels service was protected when WRVS gave up the contract and the continued growth of the countywide Carers Support Service. Keeping Council Tax as low as possible whilst continuing to deliver vital services for all our residents is a key aim which is demanding when money we receive from government is reducing. · Supporting fairer and additional funding for local schools. · Opposed the building of an industrial/commercial incinerator in our area. 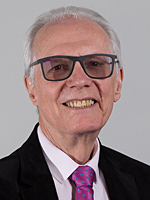 · Voted against a 2nd runway and contested disruptive flight path trials at Gatwick Airport and with our local MP lobbied government for no increase in night flights. · Challenged the North Horsham Housing development and help present alternative plans to Horsham District Council. · Improvements around Littlehaven Station area to prevent excessive commuter parking and in Fay Road and Ashleigh Road to improve amenity for residents. · Added new safety measures for crossing the A264 at Northlands Road to Old Holbrook and continuing work with police on speeding and HGVs using our roads. · Enabled the successful handover of Holbrook Community Centre and Youth Club from Council to community use, working as a member of the Management Team and supported the County to buy the Novartis site as a Science Park, bringing new jobs to Holbrook. Being County Councillor for Holbrook is a great honour and I never forget my responsibility of being accountable to all residents, representing everyone's interests, taking up their concerns and getting things done.